Anyone who has followed Ken Griffey Jr.’s storybook career, first with the Seattle Mariners, then with the Cincinnati Reds and most recently with the Chicago White Sox, knows that he has always been a big supporter of charities for young people. But one of most memorable moments came on Christmas Eve 1994, when “The Kid” plopped a Santa hat on his head and took his place at the head of the food line, passing out paper plates, to the children at the Rainier Vista Boys & Girls Club (in a Seattle suburb). 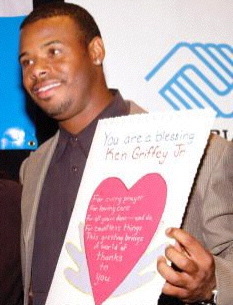 Up until then, the kids and staff of the Boys & Girls Club knew that Ken Griffey Jr., like some friendly ghost, was involved with the community center. After all, he had donated the van he won as the MVP of the 1992 All-Star Game to the organization. When he was asked to pose for the cover of Sports Illustrated For Kids the very next year, he invited an eight-year-old girl from the club to co-star with him. As sponsor of the holiday dinner for 350 children and teenagers, Griffey donated $10,000 to help provide food and music, balloons and gifts. But the most important thing he provided was a glimpse of their hero, and the belief that a wish can come true. “When I was a kid, I knew that if I wanted something bad enough and worked hard enough, anything was possible,” Griffey said. Editor’s Note: Griffey has sponsored the Rainier Vista Boys and Girls Club every December since 1994, and is a frequent visitor to clubs everywhere he has played/lived throughout his career. What he didn’t say on that day fourteen years ago (probably because he didn’t even dare to dream it himself) is that he would ride that positive attitude to the 600+ home run plateau.